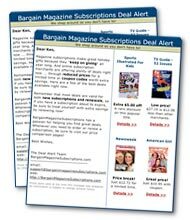 Our free email newsletter will keep you informed of great discounts and coupon deals on magazine subscriptions. Submit your email address below, then reply to the confirmation message that we send to your inbox. This ensures that only YOU can add your address to our email list. Your email address will never be sold and is used only for sending you deal alerts. Sign up to receive Deal Alerts by email.